Achieving physical, mental, emotional, and spiritual balance is important to everybody. However, when encased in pain, maintaining the necessary focus seems like trying to climb Mount Everest without oxygen. Learning to have a positive dialogue with our besieged body, overcome obstacles, and achieve goals can have a significant impact. Unnecessary struggles can be avoided when we have strings tied to our fingers or notes pinned to our coats as constant reminders. Fall Devotions is the first in the miniseries and it provides noteworthy knock-- knocks we frequently lose track of because our pain is in boss mode. 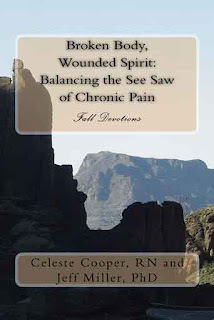 Improving personal beliefs about pain is the catalyst in our healing process. Come join us as we walk the clearing from the wind-swept fallen leaves. After years of laboring in love, we are please to announce that the first book is now available on Amazon and is available for super savings. It will be available on all major book retailers sites soon. Hi! I've been following your blog for a while now and finally got the bravery to go ahead and give you a shout out from Huffman Texas!